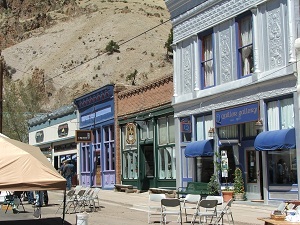 The Annual Taste of Creede is held every Memorial Day Weekend. This year I (Debbie) enjoyed spending a day enjoying the festivities. Creede was celebrating their 22nd Annual Taste of Creede. This weekend celebration is a great way to kick off the summer and it includes fine arts auctions, “Silver Chef” Cooking Competition, free samples from restaurants, and shopping. I had the pleasure of watching the “Silver Chef” cooking competition. This competition was enjoyed by many people on the main street which was closed off allowing vendors to sell their merchandise. 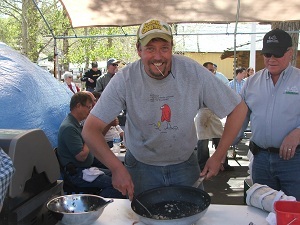 The Taste of Creede cooking competition was divided into a professional and an amateur category. At 2:30 p.m. the professional cook-off began. Each contestant was given ingredients and had 45 minutes to prepare a meal. After the cooking was completed and the judges tasted the food preparations to determine their winner, everyone was invited to taste the prepared food. This year’s winner was the chef from the 4-UR Ranch south of Creede. Our good friend, Ike, was one of the competitors for the professional competition. I have to have the corn salsa with cilantro recipe that he made as part of his meal—it was SOOO good! The Main Street was alive with live music and artists for the Artists’ Street Demonstrations. These demonstrations were held Saturday from 10 a.m. until 4 p.m. and Sunday from 10 a.m. until 2 p.m.
Not having an artistic bone in my body, it was fascinating watching an artist paint right in front of me. One artist was painting the main street of Creede. Another artist was painting the backdrop of Creede, a scenic mountain. Sunday the artists were participating in the annual “Artists’ Quick Draw”. Sunday also held the very popular art auction. There were tours of the Creede Repertory Theatre on Saturday and Sunday as well. With Main Street closed off, there were many vendors selling jewelry, artwork, and food along with the entire Main Street stores open for business. I also enjoyed visiting with our good friends the Miles Family. 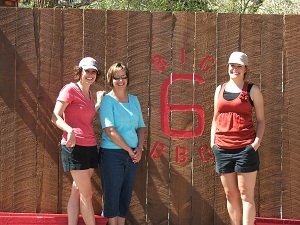 They own the Big 6 BBQ located right on the corner as your turn north into Creede. This is a family run business and you can enjoy wonderful food and very friendly service. And one more thing, keep an eye out for wildlife. As I neared Cottonwood Cove on my drive back to the Valley, a mountain sheep jumped the embankment, crossed the highway, and headed up the mountain. There are always deer, elk, mountain sheep, and an occasional moose if you are looking.